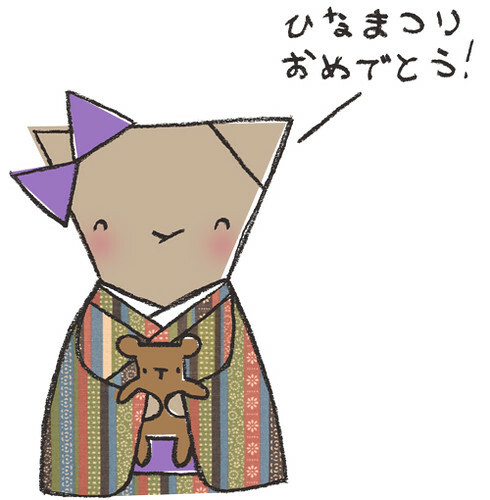 Today is Hinamatsuri, the Festival of Dolls, or Girls' Day as it's also known. I spent the day helping out at the tearoom at our Hinamatsuri tea gathering -after we'd first shovelled a few snow drifts out of the way so we could actually get to the tearoom! It snowed a whole lot last night, making what was looking very promisingly like Spring take several steps back into Winter again. Hinamatsuri is, in addition to being a celebration of dolls and girls, a herald of Spring, even if the weather may think otherwise. :) Regardless of the snow, we had a nice little celebration of all things girly, where we hopefully managed to at least evoke the feeling of spring even as Winter very much held on outside.